Okay, so, I’m a writer and as a writer, I find, well, writing, easy. But I recognize not everyone shares my feelings on this. I meet with hundreds of clients a year and as I’m advising them on their digital growth strategy, inevitably, one of my first questions is, are you able to add a blog to your website? Blogs are the quickest and best way to grow your SEO and move up the Google algorithm rankings. My answer is always, 100%, yes! Anyone can write a blog, and I’ve compiled some steps you can take to get started! Start with an easy one. An About Me post. This type of post will serve a few different purposes. First off, it will start you on the relationship building side of things. It’s kind of a like a first date intro. You’re essentially dating the client, or well, the client’s dating you. Doesn’t matter, what matters is, just take five hundred words and introduce yourself. You can introduce your business, but people do business with people they know, like and trust, so, open up your personal side and see where that takes you. Secondly, an About Me post will get you writing without having to recreate the wheel. For your next post, think about the most asked question you get and expand upon your answer. Start with writing five hundred to one thousand words and see where it goes.For example, you’re in the plumbing and heating business (I have a client who’s implemented this strategy with this biz ) and you’re specialty is outdoor fireplaces and the question most people ask you is what type of stone is best to use when building this project. You can answer back inside of a blog post, and expand upon why its best and what other options are out there, supplemented with pictures of jobs you’ve done and insert stops along the blog to sign up for a free design consult. Done and done. Second blog post complete and you’ve offered a CTA. My favourite method of uncovering what to blog about is to use Pinterest. Start to think of Pinterest as a search engine with beautiful images, NOT a social media platform and use it to type in common keywords your clients would be using to find a service or store such as the one you have. I’ve inserted a few pics to demonstrate how to use this tool. 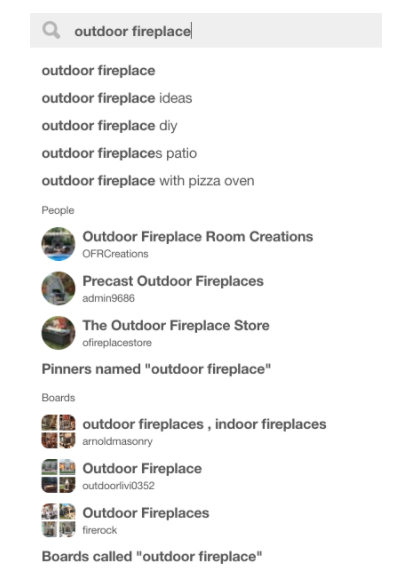 The first example is what happens when I go back the outdoor fireplace project and simply type that into the search engine. The results offer up the next most popular keywords used. So you can see, ideas, diy and patio are the next most used keywords. Then it shows you other Pinterest accounts and boards that have the same interest. The next example shows the results board and how many next click options there are. DIY, Backyards and Covered Decks are the next most popular searches. Now you’ll be able to clearly see that yes, outdoor fireplaces are frequently searched on, and that creating a Pinterest account is a clear winning idea, but blogging about all of these subjects is also a great idea. You can create a blog post on samples of backyards with outdoor fireplaces, a blog post on how to mount a tv above the fireplace, possibly different design features. Pinterest has already done all the work for you regarding the most popular needs for your potential clients. My final tip to finding content to write about requires a little bit of work. You’ll need to set up a Pinterest business account and grow the account a little before you can access insights into popular posts, but once you’ve gotten that done, you’re off to the races! Anywho, once you’ve mastered the Pinterest business feed, your analytics will show you the most popular posts that you’re pinning that aren’t yours. Then you can take that area of interest and write your own blog post on the subject, knowing that it’s something that a lot of pinners are looking for. If you’d rather skip the mini-intro webinar and head right into the full course on using Pinterest in just 10 minutes a day to grow your business, (It’s only 8 modules long) click the button below. Okay, so those are my favourite ways to come up with content to blog about. My best advice is to just start. It’s so good for your SEO, for establishing yourself as an expert and for understanding the keywords that motivate your clients to buy. I’d love to check your blogs out once you start posting! Leave a link in the comments below! 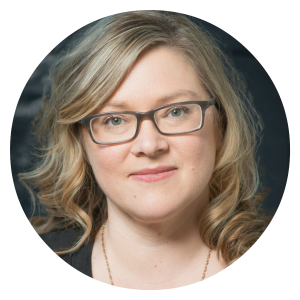 With a background in sales and marketing, Holly has been advising businesses, both large and small for the past twenty-three years. She has been the Business Advisor In Residence for the Stratford Perth Centre for Business, offering start-ups and existing businesses guidance and training, specializing in the area of digital marketing. Holly has written and published six novels, and currently operates two businesses, The Socialvert and Mortimer’s Travels alongside her government post. She is an accomplished public speaker and enjoys furthering her passion for teaching teen and tween girls how to build a business and be the CEO of their own entrepreneurship dreams. Your homepage is traditionally the most visited page on your website. You only have a *few short seconds* to grab your reader’s attention, entice them to read more and click your Call-to-Action. This means your copy and imagery need to spark an instant attraction or chances are your potential lead will be a thing of the past. Below is our Ultimate Home Page Checklist to help you attract your target audience, design a killer user experience, and start converting more leads to grow your online business. Simplify Your Navigation: If you have more than 5 or 6 tabs on your navigation structure, it’s time to think about consolidating information and simplifying that design. Less is more in this case and having ONLY your primary services or pages here will help minimize options + user distraction and return the focus to your selling points, opt-ins, and Call to Actions. Create A Benefit-Drivin Headline: The real estate below your navigation should include a headline that instantly captures your readers attention and justifies why they searched out your website in the first place. Including a captivating image here is key in visually portraying your messaging and complementing your headlines goal. Emphasize the outcomes of working with your business. Think about the one thing your target audience wants and tell them how you can help them achieve it. Who You Are: Introduce yourself and your services. You can add a few bits about your experience here, your goals for your business, and your mission and commitment to your customers/clients success. Who Do You Help? This is your chance to tell the world who exactly you serve. Whether it’s the small business community, fitness professionals, the medical community, etc. Here is where you want to explain who your target audience is so visitors to your website immediately know that you’re going to be a good fit for them. What Problems Do You Solve? Think about who your dream client/customer is. Envision their biggest struggle and show them that you understand what they’re going through by talking about their problem. The Benefit Of Working With You: Here is your chance to delve into your specific service(s) that you offer and explain the benefits of working with you. What will your clients life be life afterwards? This is your chance to be specific. Call To Action(s): Now that you’ve explained how amazing you are, you need to give your readers a chance to sign up for your service, contact you for a consultation, download a free offer, etc. Add your CTA’s around your home page so your reader doesn’t have to search too long and hard to find it. A Photo of You: Readers like to put a face with a name. Add a photo of you or your team here to humanize yourself and help your readers get to know you. Success Stories: This is a great opportunity to showcase your client testimonials. Place a few happy stories below your service descriptions to show that you have street cred in your industry. These help seal the deal because your readers can see that you’re an expert and really know your stuff. Opt-In: If you don’t have an opt-in on your home page then you’re missing out on a valuable opportunity to grow your email list. Offer something enticing like free information (.pdf), free strategy session with you, or a useful e-guide. Software like LeadPages is an excellent list building tool and offers a *14 day trial* before making a commitment. Online marketing has evolved drastically over the last 2-3 years. Staying on top of new trends in functionality can be challenging for a small business owner. Even trying to understand all the new terminology, such as “mobile optimization” and “dynamic content,” can get overwhelming. Don’t fret, we’ve got you covered! 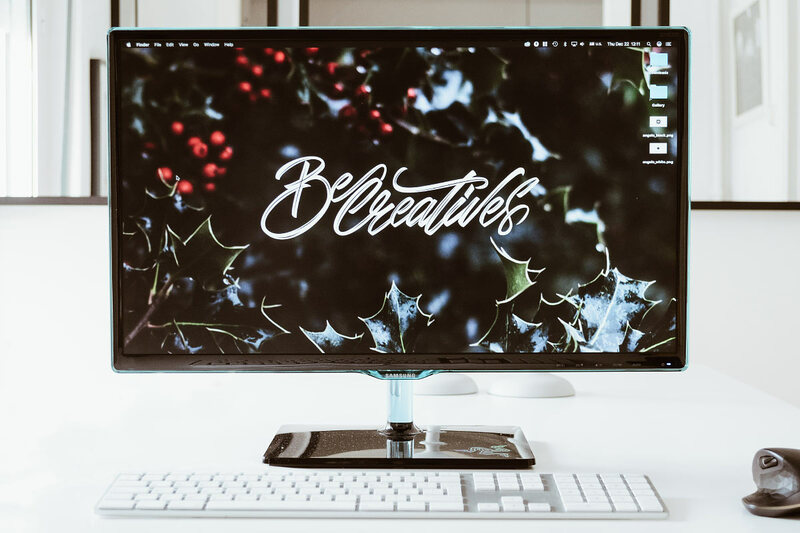 Tap House Media has broken down The 4 Essentials For A Great Website to help guide you on your journey to website greatness. According to market research, our brains process visuals 60,000 times faster than text. Website aesthetic – not the written content on the screen – is your first chance to reach out and grab your audience. Without quality design, your visitors likely won’t take the time to read the content you’ve invested in. The designer’s job is to create a compelling experience for the reader at the other end of the screen. We do this by using aesthetics and design to expose your brand. Your website should convey the spirit and culture of your company. Are you open and fun, serious and conservative, or friendly and informative? Each of these emotions would require a different imagery, layout and typeface for your website. Even the colors you use will impact visitors’ emotional experience on your site. Website design elements are exponentially more powerful than content, in terms of mistrust. For example, if you land on a website that is outdated, not functional, and poorly designed with a busy interface and small fonts, you’re more likely to choose to bring your business elsewhere – more than likely to a company that showcases a website with a more professional, thoughtfully planned look. Websites should be updated/redesigned every 3-5 years to stay up-to-date with new trends in design and functionality. Your website is a tool that should ultimately serve your audience. From the visual aesthetics to the functionality, all design techniques should work together to improve your site’s ability to serve. 74% of businesses believe correcting your site’s user experience is key for improving sales, conversions, and loyalty. Really terrible sites fail because they were designed for a company, not for the reader. If your visitor doesn’t know where to look and what to do on your page, they will leave. Look at every page element through your readers’ eyes and correct anything that is confusing or out of place. Not only does this serve your visitors, it will also improve your bounce rates. In 3 – 5 seconds, can someone look at your page and know: Who your company is, what you do, and what you want the visitor to do on the page? If not, revisit both your value prop and design with a professional team to highlight those important messages. 2. Over 20% of Google searches are performed on a mobile device. Having a mobile website is no longer simply a nice feature. It is now a necessity and literally impacts the growth of your business. If you’re consistently creating content that’s helpful for your target customer, it will help establish you as an authority in their eyes. This is a great method for Sales and Service professionals, but obviously can be used for ALL business owners. Instead of pitching your products or services, you are providing truly relevant and useful content to your prospects and customers to help them solve their issues via your blog. Begin a plan for content marketing and be consistent! Content marketing drives traffic to your website. Every time you write a blog post, it’s one more indexed page on your website, which means it’s one more opportunity for you to show up in search engines and drive traffic to your website in organic search. Content marketing helps convert traffic into leads. Just like every blog post you write is another indexed page, each post is a new opportunity to generate new leads. The way this works is really simple – just add a lead-generating call-to-action to every blog post that directs to your landing page.